Day 165: Laissez les bons temps rouler . . . So, here we are – Fat Tuesday 2013. Although we aren’t from Louisiana, we are of Cajun persuasion, meaning we do love a reason to get together and enjoy a celebration. And . . . what better reason to get together and celebrate as we prepare for Ash Wednesday and the beginning of Lent. We had quite a bit of Mardi Gras over the weekend, so kinda laid low this evening – but wanted to make sure we pulled something special off the rack that was up to the occasion. And knowing us – off we went to the land of Paso. Cypher Winery split off from Four Vines in the not too distant past after a dispute amongst the troops. We must admit, we are HUGE fans of Four Vines and are saddened by this separation – however, as sad as we are . . . life goes on and we must persevere. 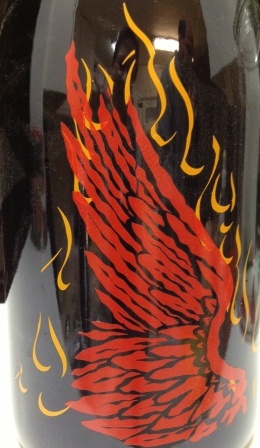 Tonight we popped the cork on a 2009 Syrah – Freakshow Phoenix. We had sampled this wine while at the tasting room in October and truth be told had forgotten how good it was. This wine actually comes as a “three-bottle set” with a right-wing, left-wing and middle thingamabob that we aren’t too sure what it was – anyway, we purchased the right-wing – must stick to our beliefs. As the cork came out the bottle so did the wonderful nose of fruit – mostly the red berry variety, but toss in a hint of oak, caramel and anise – yum! Must admit, this is a “just smell the glass” kinda wine or as we like to call it – – – “do the Deb” . . . which means you only need one glass and when finished can just enjoy smelling the empty glass for days as the aroma is so wonderful. Taught SW the trick and he has been known to indulge in it from time to time. The palate continued where the nose left off, layers of fruit danced across our tongues and tickled our throats – silky smooth and the taste hung around. At first the finish was a bit on the tart side, but as the wine opened up, the finish got softer and smoother. Can imagine that this is a wine that could get better if laid down for a bit. While the wine was super good solo – we enjoyed with a garlic pasta with chicken, roasted red peppers and black olives – gave the wine even more of a bounce. You can order the wine online, but can’t seem to find at any of our local haunts – are thinking we need to invest in another bottle or two at some point . . . maybe Day 366! So, we weren’t in N’awlins – or even Kerrville for the annual Mardi Gras festivities – but felt as though we had our own parade. Hope you enjoyed your “Fat Tuesday” and remembered to enjoy responsibly and recycled whenever possible. Categories: Uncategorized | Tags: Cypher Winery, Fat Tuesday, Freakshow Phoenix, Kerrville, Laissez les bons temps rouler, Mardi Gras, N'awlins | Permalink.